Four of the most dance floor friendly tracks from the best selling Truth & Soul compilation, African Music Today are finally available on a handsome picture sleeve 45 EP. The full length was curated by world famous world record collector and Soul Fire Records founder Phillip Lehman. The first song on side A features the Zafari track, King Masaru. An Ethiopian Big Band that was first introduced to the world through their Soul Fire 45 which featured their dance floor killer Addis Ababa. The second selection on Side A, Percussive Movement No. 1 is by the group Friends Of The Family. It features a heavy drumn break with gang vocals. Side B sets off with a Mulatu inspired song by the group The Original Brothers. 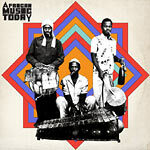 The second selection on Side B is another track by Friends Of the Family, Percussive Movement No. 2, which features a vurtuosic Kalimba solo over a heavy drum break.